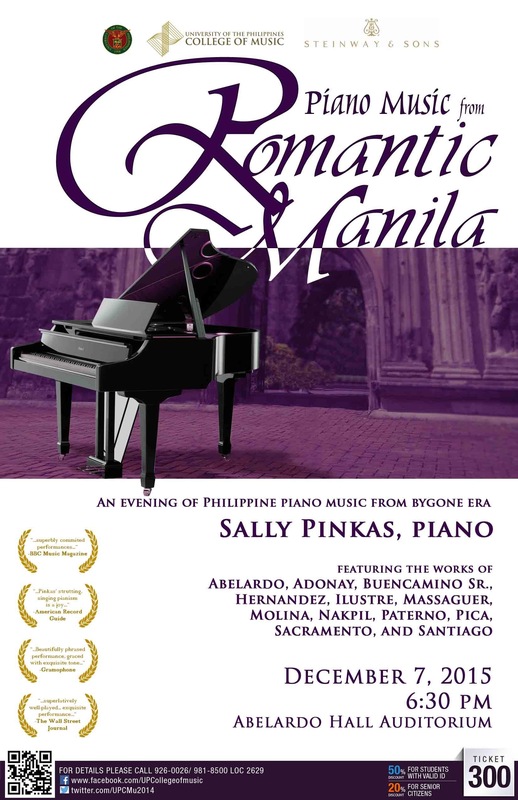 The University of the Philippines College of Music presents a remarkable concert titled Piano Music from Romantic Manila in Abelardo Hall Auditorium on Monday, 7 December 2015, 6:30 in the evening. The concert program consists of Philippine music heritage, i.e., original Filipino solo piano music from the end of the Spanish colonial period to the time of the first Philippine republic in 1960s. To be played by visiting artist from Dartmouth College, Sally Pinkas, the program consists of short compositions in light cosmopolitan music styles such as waltz, mazurka, nocturne, habanera, serenade, and so on. These works were written by three generations of composers who lived in Manila: from Hispanic Ignacio Massaguer to the first Filipino woman composer Dolores Paterno, who belonged to the first generation; Marcelo Adonay, Julio Nakpil, and Lorenzo S Ilustre of the second generation, and composers of the third generation such as Valdes y Pica, Francisco Buencamino Sr., Nicanor Abelardo, Juan Sahagun de Hernandez, Antonio J. Molina, and partly Lucino T. Sacramento. The repertoire of this historically valuable concert captures a wide range of moods such as the expression of romantic intimacies as in Buencaminos’ Damdamin, Molina’s Cradle Song, and Sacramento’s Romance; the refined and exquisite dances of Adonay’s waltz and mazurka and Santiago’s Purita, all three of which were presentation music gifted to women; the evocative, though parodic, piano art music of Abelardo’s First Nocturne, Molina’s Malikmata, and Santiago’s Nocturne in E-flat Minor; the commemorative patriotism of Nakpil’s Pahimakas and Pasig-Pantayanin, and representations of Filipino femininity such as Paterno’s La Flor de Manila (Sampaguita) and Molina’s Camia. The rest of the program are character pieces such as Massaguer’s La Bella Filipina (originally a song), Hernandez’s Caress, Buencamino’s Smile, and Nakpil’s Recuerdos de Capiz. Except for a few pieces that Pinkas will be rendering from music manuscripts provided to her by University of Santo Tomas Associate Professor Ma. Alexandra Inigo-Chua, UP Professor Elena Mirano and Associate Professor Patricia Brilliantes, most of the music in this concert were once circulated as sheet music among the affluent piano-owning middle class in Manila, i.e., at a time when urbanization and capitalism took root in the city. Admission ticket to the concert is priced 300 pesos, with 20% discount to senior citizens and 50% to students with valid IDs.